Edible marijuana products in Canada will be brought into the mix within a year after the country officially launches its recreational industry next summer, giving cannabis businesses an opportunity to enter a new market totaling perhaps 15 million people. A parliamentary committee this week amended legislation legalizing recreational cannabis to allow edibles one year after the new law takes effect. The amended rec legislation provides welcome clarity for marijuana businesses interested in entering the legal infused products business. It does not cover medical cannabis. “It’s a good sign for the industry,” said Vahan Ajamian, analyst at Beacon Securities in Toronto. Allowing edibles is expected to be a boon for licensed producers – some of which have positioned themselves for the eventual inclusion of edibles – as well as extraction businesses, makers of concentrates and, potentially, owners of cannabis consumption lounges. Previously, the government had said adult-use edibles would be allowed without providing a specific timeframe. That raised concerns that the black market involving extracts and infused products would grow unchecked after adult-use marijuana is legalized. Parliament must still approve the adult-use legislation, and a host of regulations need to be worked out. Legalization is expected to kick in next July. Paul Pedersen, CEO of Vancouver, British Columbia-based Nextleaf Solutions – which leases extraction technology to other marijuana businesses – said regulating edibles is key to competing with the black market. Other than private homes, marijuana lounges would be among the venues where consumers could partake in edibles. Both Alberta and Ontario are considering regulating lounges at some point after legalization on July 1. The potential edibles market is vast: 93% of Canadians who support legalization would purchase marijuana-infused food products, according to data from Dalhousie University professors Sylvain Charlebois and Simon Somogyi. That points to a potential market of 15 million consumers. Charlebois and Somogyi’s survey also found that few Canadians know how to use cannabis to cook at home, meaning those who want to try edibles will look to manufacturers. Greg Engel – CEO of Moncton, New Brunswick-based Organigram – expects that extracts will play a big role in the legalized market. 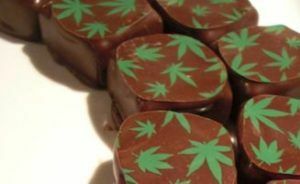 A number of Canadian companies have positioned themselves to capitalize on the edibles market once it joins the legal fold. Smiths Falls-based Canopy Growth, which is headquartered in a former chocolate factory, is one of them. “Having edibles come out of this place would be historic and special for the company,” said Jordan Sinclair, spokesperson for Canopy. Canopy, traded on the Toronto Stock Exchange as WEED, signed a licensing agreement with California-based Isodiol International to manufacture and distribute marijuana-infused, single-serve K-Cup products in Canada and internationally. Sinclair said extracts, including edibles, are “a massive part of the market” in places like Colorado, and that bodes well for the market in Canada. “Just the oils and capsules themselves have proven to be incredibly popular products from our platform,” he said. “It’s good to see the progress (by the government), because it allows us to keep planning,” he said. Organigram, traded on the TSX Venture Exchange as OGI, is another. It has the exclusive rights to sell Colorado-based TGS International’s line of cannabis extract and derivative products. Ottawa-based CannaRoyalty, which has an exclusive licensing agreement for California-based Stokes Confections’ edibles in Canada, Washington state, Oregon and Arizona. CannaRoyalty also owns edibles maker California-based Soul Sugar Kitchen and has a licensing agreement with Care by Design, a medical cannabis company offering edibles in California. Ontario-based Aphria, which owns a chunk of CannaRoyalty and is a licensee of some of its products.